The newest member of Romfh's breech'family', the Sarafina is a breech fit for a (dressage) queen. The fit of this comfy mid-rise breech is outstanding. Flattering contoured waistband, strategically placed back yoke, and wide non-binding fit allows your waist, hip, and other essets to look their best! Features Softtouch micro-PU fabric for the softest, most comfortable technical breech in the marketplace and Romfh's first breech with vertical stretch suede- Just like the European brands. 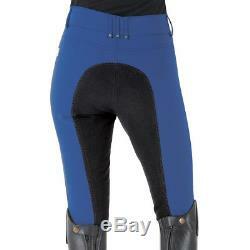 The item "ROMFH Ladies Sarafina Full Seat Breeches Lake Blue Different Sizes" is in sale since Tuesday, January 23, 2018. This item is in the category "Sporting Goods\Outdoor Sports\Equestrian\Clothing & Accessories\Women's Clothing\Jodhpurs & Breeches"." and is located in Lewis Center, Ohio. This item can be shipped to United States, all countries in Europe, Canada, Australia.